Where do you want to climb? Every year, outdoor enthusiasts join together to ascend some of the world’s most breathtaking mountains in honor or memory of loved ones who have battled cancer. The Climb to Fight Cancer allows you to touch the top of states, countries and continents while raising vital funds and awareness toward finding a cure. Since 1997, our climbers have enjoyed the thrill of standing above the clouds while raising more than $9 million to fund critical research at Fred Hutchinson Cancer Research Center. Individuals and teams from all regions of the United States join the Climb to Fight Cancer. 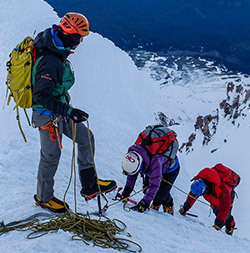 All expeditions are guided by professional guide services, creating extraordinary adventures for first-time climbers and experienced mountaineers. Whether you are seeking a new adventure, pursuing a personal challenge or wish to contribute to finding a cure the Climb to Fight Cancer will introduce you to a world unlike any other. Our volunteers support your fundraising and the guides provide physical training and conditioning recommendations. Determination is all you need to join this effort. Climb a mountain. Save a life. ©2019 Fred Hutchinson Cancer Research Center, a 501(c)(3) nonprofit organization.